The Adidas Raylors are the lightest sunglasses we've reviewed - coming in at 19g. This does also mean they feel the flimsiest, now, that's not to say they're a cheaply made product, but these certainly seem a little more 'plasticy' than the others. Unlike most of the other shades we've tested, the Raylors actually have two separate lenses rather than a single wraparound lens. They're also slimmer than most of the others for a more streamlined and compact look. While the Rudy Project's are made from 'Kynetium' and the Oakleys are made from 'O Matter', the Raylors are plastic and proud. There's nothing injected into the temples to improve grip, no space age material that's stronger than steel and lighter than a feather. It's plastic. That's not necessarily a bad thing - as we previously mentioned, they're the lightest shades we've tested, and they're also quite flexible. As you'd expect from such a lightweight pair of shades they're extremely comfortable. They pinch behind the ears rather than sit on them to minimise pressure. They're also really secure, as there's no weight behind them trying to rip them off your face. 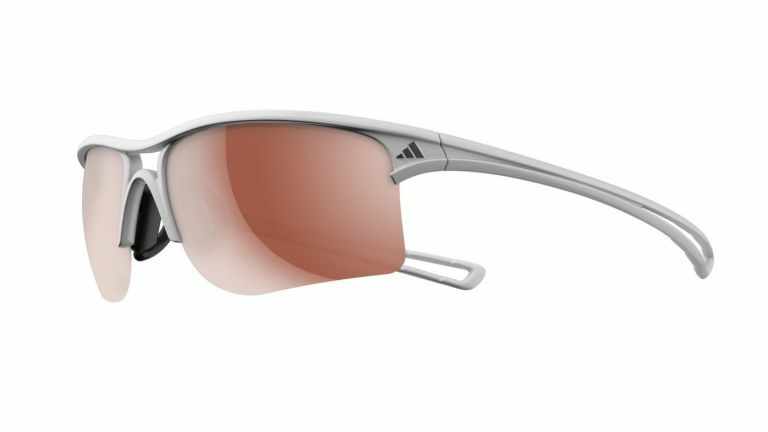 The Adidas frames come in seven different colourways - we have the Raylors in white and think they look pretty cool. The Adidas Raylors are the cheapest sunglasses we've tested, but does that also mean they're the worst performing? They're not the worst, but they're also not the best. The Raylors use Decentered Vision Advantage polycarbonate lenses. These block 100-percent of UVA, UVB, and UVC rays up to 400 nanometers. They're also pretty good a reducing glare, but not as good as the more expensive RPs or Oakleys we've tested. We tested the Adidas with LST (Light Stabilising Technology) Polarizing lenses. While they are great in the bright sun, they can be a bit dark in more shaded areas. Your whole field of view isn't covered due to the small lenses, with both vertical and lateral peripheral vision lacking protection. The Adidas Raylor S sunglasses come with both a hard plastic case and a soft case. They're both okay quality and offer decent protection. For their price, the Adidas Raylors are a very good pair of sunglasses. They're the lightest pair of shades we've tested and they offer decent optical performance. They're comfortable, and despite not having high-tech materials and a clever aerospace design they still sit very securely on your face. They do feel more plasticky than the others we've tested and they don't as good coverage as the shield glasses, but for the price, we'd strongly recommend these.